As with so much surrounding the Hammond organ, there's much more to the Leslie rotary speaker than meets the eye, and synthesizing its effects involves considerably more than just adding vibrato, as we find out in this installment. Photo: Richard EcclestoneFor three months, we've been investigating the sound of the Hammond organ, spending two of those months recreating the sound of the tonewheel generator, and a third attempting somewhat less successfully to emulate the onboard effects provided by 'the real thing'. But, as we all know, the classic jazz/rock/pop organ sound is as much a consequence of a rotary speaker as it is of the organ itself. So, in this fourth article dedicated to understanding and synthesizing the organ, we're going to concentrate on the physics and sound of the 'Leslie' speaker. What we now recognise as the rotary speaker did not materialise as a fully developed concept overnight. In an effort to animate the sound of the Hammond electromechanical organ, Don Leslie had been experimenting with all manner of systems before he alighted upon what he called a 'Vibratone Speaker', but which is what we now call the classic, twin-rotor 'Leslie'. One of his early experiments was a monstrosity with 14 speakers mounted inside a rotating drum. Fortunately, while paring his ideas down to a manageable size and complexity, Leslie found that just two speakers (mounted inside a cabinet, as shown above) generated the most pleasing sound. One of these was a treble unit that produced the frequencies above 800Hz, and which played upward into what looks like two rotating horns (although one of these is a dummy, provided only to stop the whole assembly from shaking itself to bits). 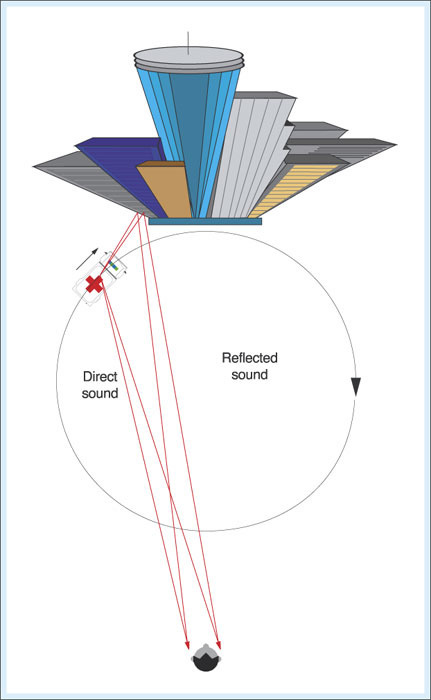 The second was a bass speaker reproducing frequencies below 800Hz, played downwards into the single rotating 'rotor' (see Figure 1, below). Figure 1: Don Leslie's twin-rotor speaker cabinet.Leslie provided each speaker assembly with two rotation speeds — one slow and one fast — that he called 'chorale' and 'tremolo', respectively. The rotor's chorale speed was different from the horn's, as was its tremolo speed, and the transition rates between slow and fast (and vice versa) were different for the two assemblies. The result of playing a sound through this device was, therefore, a complex effect that combined pitch modulation, amplitude modulation, tone modulation, and reverberation (ie. the effect of the enclosed cabinet), with the high frequencies and low frequencies swirling around independently to create a very pleasing and expansive sound. What's more, Leslie found that, by placing the cabinet close to a wall or to the corner of a room, he could use the additional reflections from those surfaces to obtain a stereo field from a single, monophonic source. 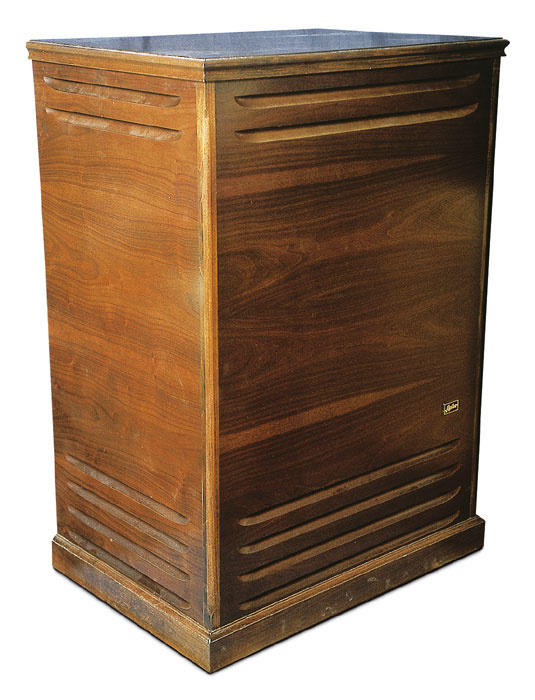 Nowadays, there are dozens of models of Leslie speaker, and numerous physical as well as electronic imitations. Some Leslies have single rotors, but the sound produced by these is inferior to that offered by the larger, dual-rotor models characterised in Figure 1. Others are built into their host organs; a common example is the single-rotor unit found within the Hammond T500-series organs from the mid-1970s. And, of course, no modern organ emulation could be considered complete without the inclusion of a digital recreation of the Leslie speaker effect. Figure 2: Observing the waves from a stationary ship.Christian Johann Doppler was a scientist who died as long ago as 1853, yet he explained something that we all experience; the fact that, when something emitting a sound is moving towards us, we perceive a higher pitch than when the same sound is moving away from us. To understand why this is the case, we'll start by following Doppler's line of thinking, and consider an archetypically 19th-century mode of transport: a ship. Imagine, if you will, a docked liner floating in a harbour with the tide coming in. If this is facing into the direction of the tide, the waves will be breaking against the bow once every few seconds. Let's say — for the sake of argument — that the peak of each successive wave is reaching the bow five seconds after the previous one, as shown in Figure 2 (above). 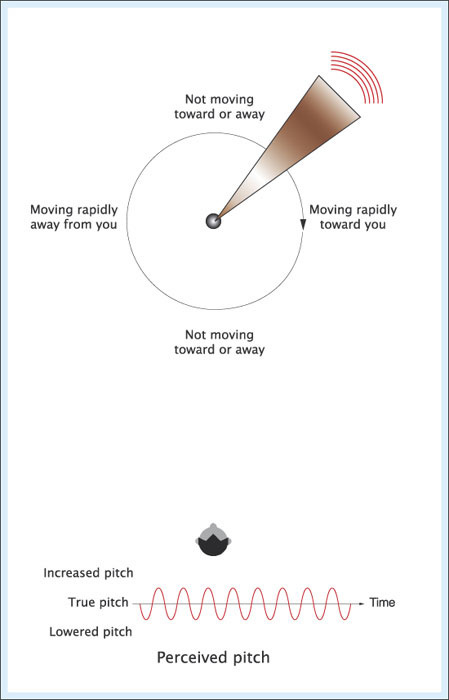 Figure 3: Moving into the waves increases the perceived frequency. Now let's imagine that the ship is surging through the seas, with the bow cutting through the waves like... well, like a million tonnes of cruise liner cutting through the waves. 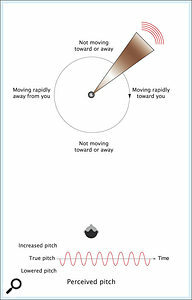 If the direction of the tide is unchanged and the ship is still pointing in the same direction, the time between wave crests will be much reduced — say, to one crest every three seconds (see Figure 3 above). 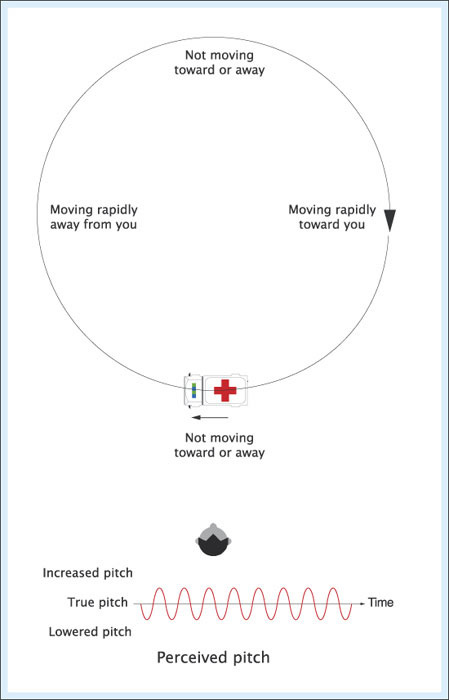 Figure 4: Running from the waves reduces the perceived frequency.Finally, let's imagine that the ship has swung right around and is heading back the way it came. As you would expect, the wave crests are now reaching the stern at a slower rate than before — say, once every seven seconds, as shown in Figure 4 (above). The frequency of the waves hasn't changed, but by moving in the same direction as the waves, or in the opposite direction to them, we have demonstrated that the frequency at which we observe a waveform is relative to our motion with respect to it. This is the effect that Doppler not only observed but also quantified, so history has seen fit to call it the Doppler effect. 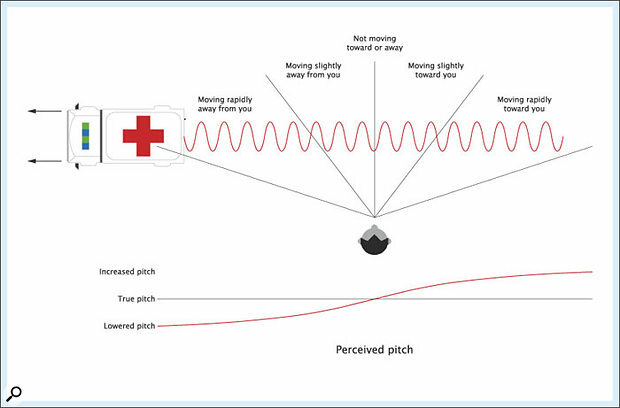 Figure 5: The pitch of an approaching ambulance siren is higher than if stationary.Now, you don't need to be standing on an ocean liner to experience the Doppler effect. An equivalent shift in pitch occurs when you are stationary and something emitting a wave — say, the siren mounted on top of an ambulance — is moving toward you or away from you. 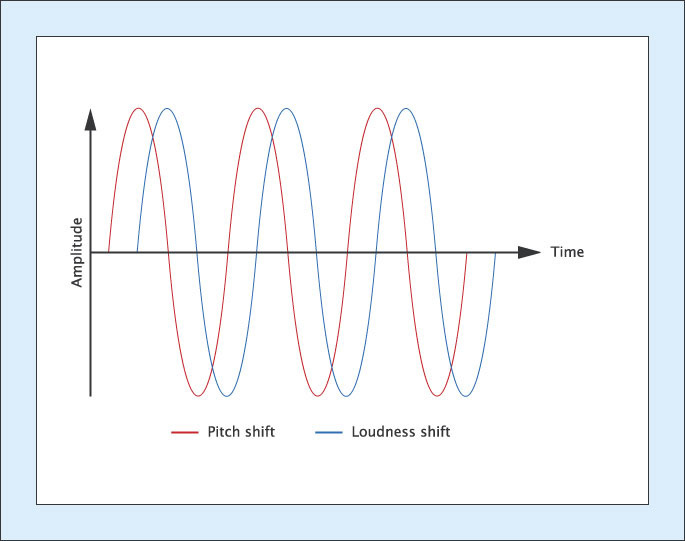 In the first instance, the vehicle has moved a little closer to you as its siren emits each subsequent peak in the waveform, so the wavelength is shorter than it would otherwise be, and therefore higher in pitch (see Figure 5). The reverse occurs when the ambulance is moving away from you, with the siren a little further away each time it emits a peak. 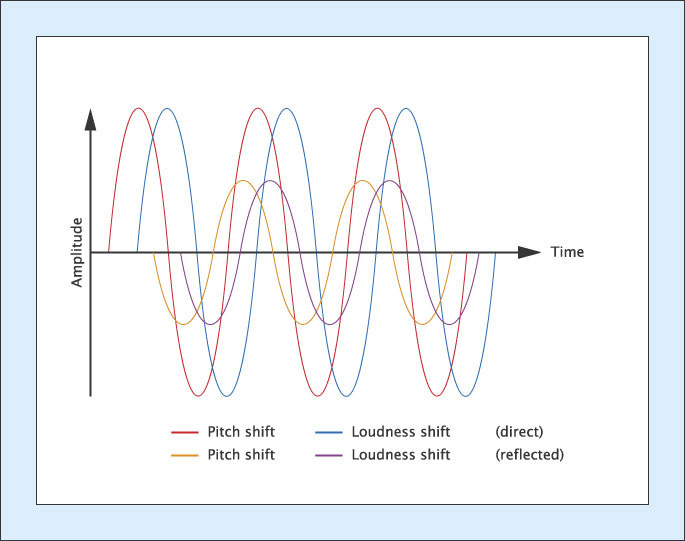 In this case, the waveform is lengthened, and the pitch is lowered (see Figure 6). Figure 6: The pitch of a receding ambulance siren is lower than if stationary. Matters are complicated slightly when the ambulance is not travelling directly towards or away from you. Consider the case where you are standing on the pavement as it goes by. At the exact moment it passes you, it will neither be approaching or receding, and you will hear the true pitch emitted by its siren. 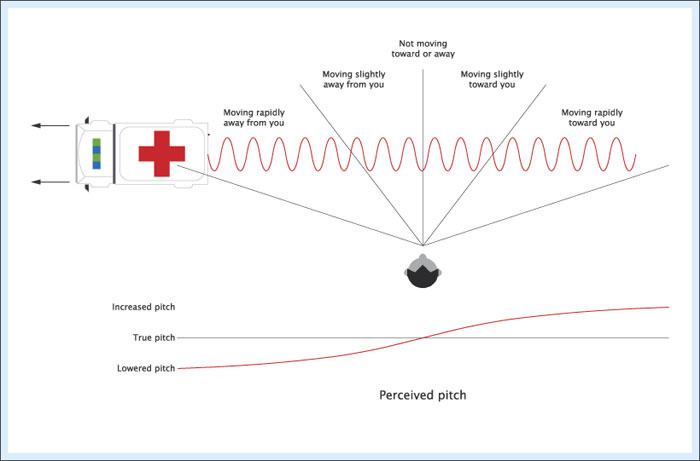 So it should be intuitively clear that the change in pitch describes some sort of curve as the ambulance passes. This is the case illustrated in Figure 7. Figure 7: How the pitch changes as the ambulance passes. Figure 8: The observed pitch when the ambulance is stuck on a roundabout.Everything I've described so far is relatively straightforward, but it doesn't explain the sound of the rotary speaker cabinet, so please bear with me while I extend the 'ambulance' analogy somewhat further, whereupon all will become clear. 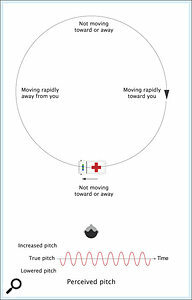 Instead of considering the ambulance siren moving toward or away from you in a straight line as shown in the diagram above, imagine that the vehicle is stuck on a roundabout, forever circling as it fails to find an exit. 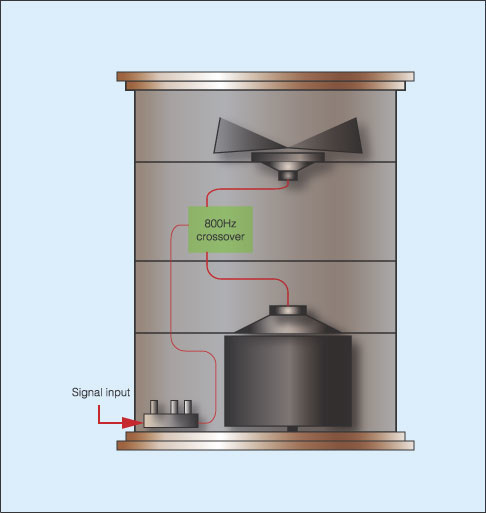 Clearly, the siren's pitch will appear to be raised when the vehicle is moving towards an observer on the roundabout, and lowered when it is moving away. There will also be two instances — when the ambulance is neither moving toward nor away from the observer — when the pitch is heard unaltered by the Doppler Effect. Without going into the trigonometry of the situation (which would involve a little mathematics and no doubt elicit yelps of pain on the SOS Readers' Forum) I can tell you that — provided that the speed of the ambulance is constant — the change in perceived pitch is described by a sine wave (see Figure 8). 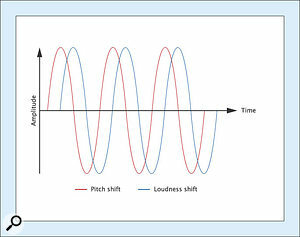 Figure 9: The perceived pitch shift of a rotating horn speaker.Now, if we replace the ambulance and siren in Figure 8 with the aperture of a horn speaker, we can see that the analogy explains the first element in the rotary speaker effect. As the horn aperture moves toward you, the perceived pitch of the sound it is radiating is raised; when the aperture moves away from you, the perceived pitch is lowered; and the nature of the pitch-shift is again described by a sine wave (see Figure 9). Looking again at Figure 9, it should be obvious that the pitch of the note is not the only thing affected by the rotation of the horn. In particular, the perceived sound is going to be much louder when the horn is pointing towards you than it is when the horn is pointing away from you. What's more, it's going to have some intermediate loudness when the horn is pointing sideways. It doesn't take a genius to realise that the perceived loudness curve is also going to be a sine wave, or something very similar. Figure 10: The sound from the horn exhibits both tremolo and vibrato, out of phase with each other.This means that the motion of the horn aperture is generating not one, but two sonic effects. The first is vibrato, with its peak occurring when the horn is moving fastest toward you (when it is pointing to the right in Figure 9), while the second is an amplitude modulation — or tremolo — with its peak occurring when the horn is pointing straight at you. This means that the vibrato is 90 degrees out of phase with the tremolo (see Figure 10). If you're not sure what '90 degrees out of phase' means, take a look at Part 4 of this series, way back in SOS August 1999. Although this may seem a little complex, it's very simple to synthesize if we use an oscillator as the sound source. 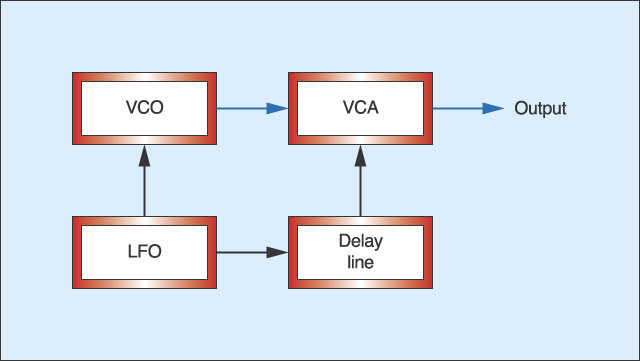 It requires just four modules to generate the effect; the VCO generates the initial sound, a sine wave LFO emulates the rotary motion of the horn, and a delay line connected to a VCA introduces the phase-shift between the frequency modulation and the amplitude modulation. Hooked together as in Figure 11, these would generate a waveform exhibiting both vibrato and tremolo, but with the two 90 degrees (or some other desired amount) out of phase with one another. Figure 11: Recreating the phase and modulation characteristics of Figure 9. Unfortunately, this is still not a complete description of the effects imparted by the rotating horn, because the tone of the sound will also change throughout the cycle. The manner in which it does so is not intuitively clear. It is certainly not straightforward, because to understand this we would need to analyse such nasties as the backward projection from the horn driver, introduce some fluid dynamics to determine how sound is propagated 'backwards' through the air, and look into the refractive edge effects of the horn itself. Trust me... these are matters best left alone unless you fancy studying acoustics for a PhD. Nonetheless, we can say with some confidence that, whatever other changes take place, the sound will be brighter when the horn is pointing towards us, and duller when it points away. This suggests that the tonal modulation lies in phase with the loudness modulation, and that we can synthesize this — to a first approximation — by adding a low-pass filter modulated by the delayed LFO signal that is driving the VCA in Figure 11. The result looks like Figure 12. Figure 12: Adding tone modulation to Figure 11. Figure 13: Reflecting the sound off an office block.However, even this is far from a description of a rotary speaker, because neither the horn nor the rotor in Figure 1 are rotating in free space. So let me return for a moment to the analogy of an ambulance stuck on a roundabout. Imagine that, on the opposite side of the roundabout, there's a large, reflective surface of some sort... say, a large office block (see Figure 13). This will reflect back some of the siren's sound that would otherwise travel forever away from you, and you'll hear this mixed in with the direct sound. If you consider what is happening to the reflected signal, you'll appreciate that — due to the Doppler effect — the pitch of the sound is at its highest when the ambulance is moving toward the office block, and its loudness and brightness are greatest when the ambulance is alongside the office block (ie. at its point furthest from you). If we ignore, for a moment, the finite speed of sound, this means that the pitch, loudness, and brightness modulations of the reflected signal are 180 degrees out of phase with those of the direct signal. However, we can't ignore the finite speed of sound, so what we hear is delayed by an additional amount proportional to the greater distance that the reflected sound must travel. This means that the phase change of the effects is not 180 degrees, but some other amount, as illustrated in Figure 14. 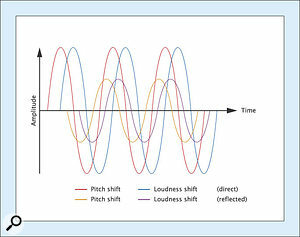 Figure 14: Considering the phase and amplitude of the reflected sound. But this still isn't the end of the story, because we have not yet taken into account the additional changes in tone that occur as the sound is reflected off the surface, and as it is absorbed by the air. Experience teaches us that, if the original signal occupies a broad band of frequencies, the direct sound will be brighter than the reflected sound. 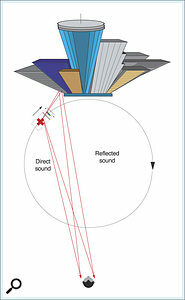 I think that it's safe to adopt this as an accepted — if unproven — part of our analysis because firstly, the reflected sound travels further, so more high frequencies are absorbed by the air, and secondly, the building will reflect lower frequencies better than others, thus imparting a duller tone to the sound. In addition to this, the delayed signal is going to interfere with the direct signal, resulting in constructive and destructive interference, which in turn will result in comb filtering of the sound that you hear. 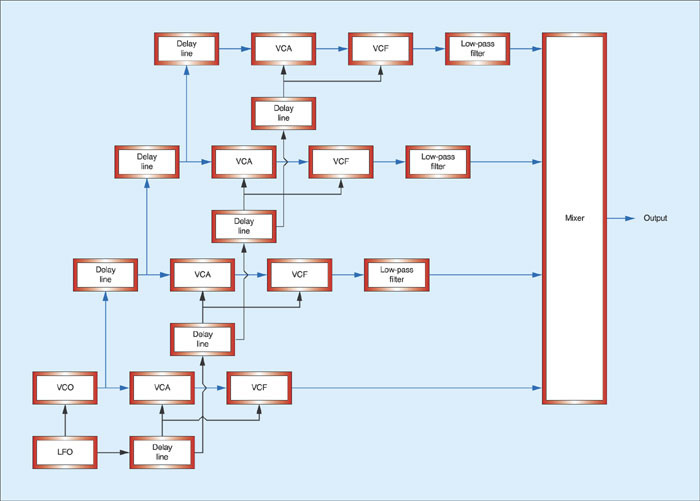 We can synthesize Figure 13 in block-diagram terms as shown in Figure 15 (below). In this, I have added a second set of delay lines, filters and VCAs to Figure 12, thus creating a second signal path that provides the delayed, lower-amplitude 'reflected' signal. In an attempt to be as accurate as possible, I have also added a gentle low-pass filter in the second signal path, which emulates the additional loss of high frequencies in the reflected signal. Figure 15: Synthesizing the direct 'rotary' sound plus one reflection. Clearly, placing just one reflector in the system complicates matters hugely, but that is as nothing compared to the complexities of a real rotary speaker cabinet which (ignoring the top and bottom) has four sides. 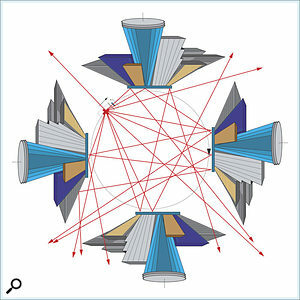 If I may use my analogy one last time, this would be like placing three more office blocks on the remaining sides of the roundabout, such that the sound source is surrounded by reflective surfaces (see Figure 16 below). It's pretty clear that the interactions between the enormous number of signal paths thus created are going to become very complex, very quickly. Figure 16: Bouncing the sound inside a quad of office blocks.Contrived though this analogy may seem, it's a surprisingly good description of the physics of a rotating speaker. The only difference in the geometry is that, instead of escaping through gaps in office developments, the sound of a rotary speaker escapes through holes cut into the sides of the cabinet. This means that we can use this model of pitch-shifts, amplitude-shifts, tone modulations, and reflections to develop ways of synthesizing the Leslie itself. But be warned... the solutions are far from trivial. Indeed, the fact that there was never a convincing 'analogue' Leslie effect is a dead giveaway. Consider this: Figure 15 is already starting to look rather complex, but we now have to imagine what happens when we add all four walls of a Leslie cabinet (ie. the multiple reflective surfaces in Figure 16) and try to synthesize all of the signal paths thus generated. The result is completely impractical, both in terms of the number of analogue synth modules required, and in the amount of paper that we would need to represent them. 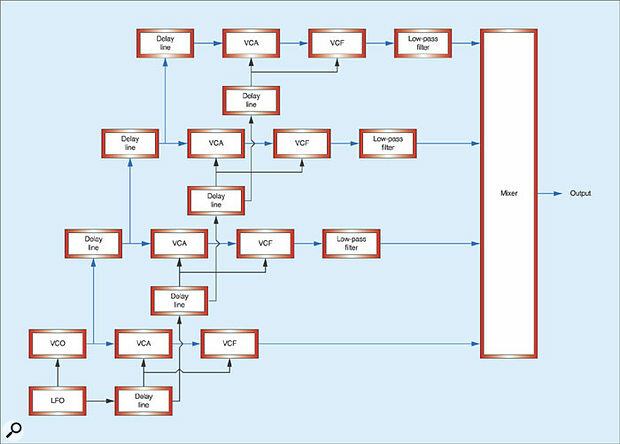 Figure 17 shows the modules required to model just three reflections, and this is already becoming a nightmare. When you consider that wherever you may stand in space, the sound you hear coming from a Leslie comprises many thousands of such paths, you can appreciate the size of the problem. 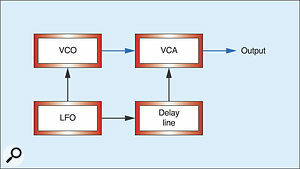 What's more, sophisticated though Figure 17 appears to be, it is in fact rather inelegant, with all of its individual VCFs, multiple delay lines, and all the signal paths' low-pass filters set to different cutoff frequencies. However, there's a bigger problem. In Figures 12, 15 and 17, we have been modulating the pitch of the sound source (the VCO) directly, rather than modulating any possible sound that we might want to affect. While this might be satisfactory for some organ sounds (for which we can modulate multiple VCOs to create a tonewheel/Leslie effect) it is unsuitable for synthesizing the complexities of, say, a guitar or human voice played through a Leslie speaker. To do this, we need to be able to input an external signal and effect this. Figure 17: Four signal paths -- the direct sound plus three reflections.